Flickr Addict, my very cool (if I do say so myself) Dojo powered application for the Palm Pre & Pixi smartphones, has just been given a massive upgrade. Flickr Addict automatically downloads photos from Flickr and sets them as your wallpaper at set intervals. It is completely configurable, and very easy to use. New image gallery, very similar to the Palm Photos app, which makes it very quick and simple to view all your downloaded photos. Full screen preview of all wallpapers. 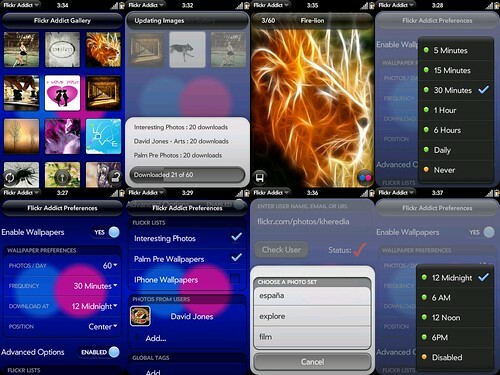 The ability to randomize the selection of photos from a user. The Palm Pre Wallpapers group on Flickr is now selectable, in addition to the iPhone Wallpapers group. See the video below for a demo. This version of Flickr Addict and Flickr Addict Lite is currently in review for the App Catalog, and will hopefully make it in soon. However the previous version is in there now and available for download, and will be updated automatically when the new version is out.